UPDATE: Following the publication of this story, The Telegraph amended its article and included this correction: “The original version of this story erroneously said the Bible claimed the Canaanites were wiped out. However, elsewhere in the Bible, it says the elimination was not successful.”. Leading British media outlets have been accused of publishing “fake news”, after stories emerged claiming the Bible has been disproved. This week, The Independent, The Telegraph, and the Mail Online reported that new evidence disputes “the Bible’s claim” that the Canaanite people of the Old Testament “were wiped out” by the Israelites. However, the Bible makes no such claim, with numerous verses describing the Canaanites’ continued existence in the Promised Land. Joshua 17:12-13 states that the Israelite people, “subjected the Canaanites to forced labour but did not drive them out completely”. And Judges 1:27-33 asserts that the tribes of Manasseh, Ephraim, Zebulun, Asher and Nephtali did not drive out the Canaanites, who “lived among them”. The news stories were prompted by a new study, published in the American Journal of Human Genetics, which cites DNA evidence that “present-day Lebanese derive most of their ancestry from a Canaanite-related population”. It states: “The Bible reports the destruction of the Canaanite cities and the annihilation of its people; if true, the Canaanites could not have directly contributed genetically to present-day populations”. In its report yesterday, The Independent did write that later passages in the Old Testament “suggest there were at least a few survivors”. 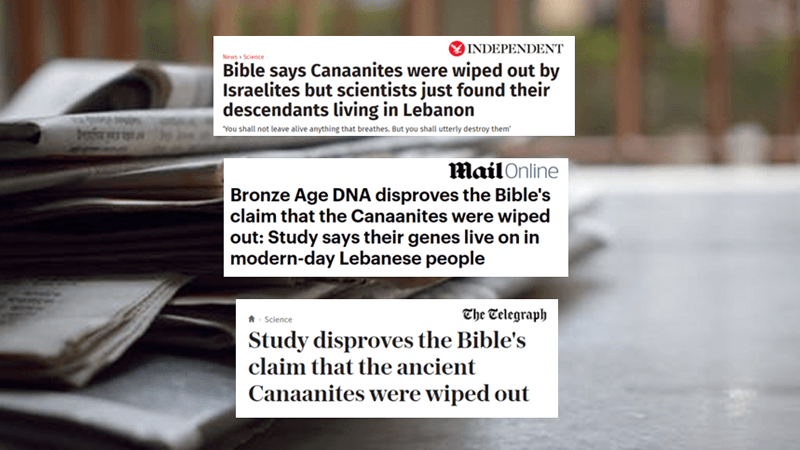 In spite of this, it published the story under the misleading headline: “Bible says Canaanites were wiped out by Israelites but scientists just found their descendants living in Lebanon”. All three newspapers cite Deuteronomy 20:17 – where God commands the Israelites to “destroy” the occupants of the Promised Land – as evidence that the Israelites actually did so. A spokesman for The Christian Institute said: “These reports prove nothing except the biblical illiteracy of UK journalists and American academics. “The Bible does not claim that the Israelite’s wiped out the Canaanites entirely. In fact, the Canaanites lived among the Israelite people for generations after the initial conquest of the Promised Land. “It is disappointing that media outlets as well established as The Telegraph, The Independent and the Mail Online would publish such blatant fake news.